I also want to say a huge, huge thank-you to those of you who have shared your stories. Personal stories of pain, grief, loss, aloneness. And so, so very many stories. All individual, all personal, all private, and all shared with love. It really bought home how common this is. How so many of us go through something along these lines in our lives. And how very, very few of us talk about it, at the time or years afterwards. How we feel we can’t talk about it, and so we bury it inside of us, a wound that never fully heals and by it’s existence helps shape who we are. Another thing that really stood out to me was the ongoing effects. The guilt that often follows us through life – feelings of guilt about not being strong enough, about having felt that way, and about not talking about it. And yet, despite how common it is, we tend to go through these experiences in silence. Both during, and after. During, we don’t feel we can talk about it – it’s too overwhelming, too all-encompassing. It’s like a tsunami looming over your shoulder, and acknowledging it’s existence threatens to set it loose to destroy everything you’re trying valiantly to hold together. And of course, the feelings of guilt, of not wanting to burden, of having no one you can talk to safely. After, we still tend not to talk about things. It’s like a guilty secret – holding inside, something that we worry will make others think about us differently if they found out about it. And the habit of not talking sticks – the scar forms over the wound and we keep our silence. Yet we all need to talk. So many of us, going through things like this during our lives. And so many of us feeling alone, feeling lost, holding on by only our fingertips. What if we all talked about it? What if it wasn’t such a social taboo? What if we were all taught about depression and it’s relatives during school, when we start university, when we’re expecting our first baby? What if there was active awareness, especially at times in peoples lives when we are most vulnerable to our brain chemistry getting disrupted? How would it change things, for even one of us, some of us, all of us? And how can we start doing this, as individuals, as friends and families, as communities, as society? Thank you again to everyone who reached out. To the encouraging comments, the caring messages, and the sharing of stories. All of you – I genuinely appreciate you. Well, hello there. It’s been a while. Quite a long while, in fact. Much longer than I expected it to be, or wanted it to be. It slowly dawned on me why it wasn’t feeling right to publish posts about pretty dresses and fun outings for photo shoots. Because it only tells part of the story – a carefully curated, positive part of the story. There’s been research done on the impacts of curation of online lives. The result it has of only ever seeing the positive, the fun, the ‘perfect’, and comparing those images and stories to the reality of your own life, in all of it’s messy, chaotic glory. And the result isn’t positive. While we all love looking at pretty things, and reading about fun things, seeing only those can make you feel that you’re not doing as well. Not having as much fun. Not succeeding in living the life everyone else is managing to live. And those are pretty dangerous feelings to have. So, this post isn’t about pretty dresses. It’s about The Other Stuff. A good friend of mine did something similar for me. When I was at one of my lowest points, she opened up about her struggles with depression and how she faced up to them. And her openness finally pushed me to go and see someone about mine. You know who you are, lovely lady. And I can honestly say – if you hadn’t talked as you did, when you did, my life would currently be very different. So, the d-word came up. Depression. 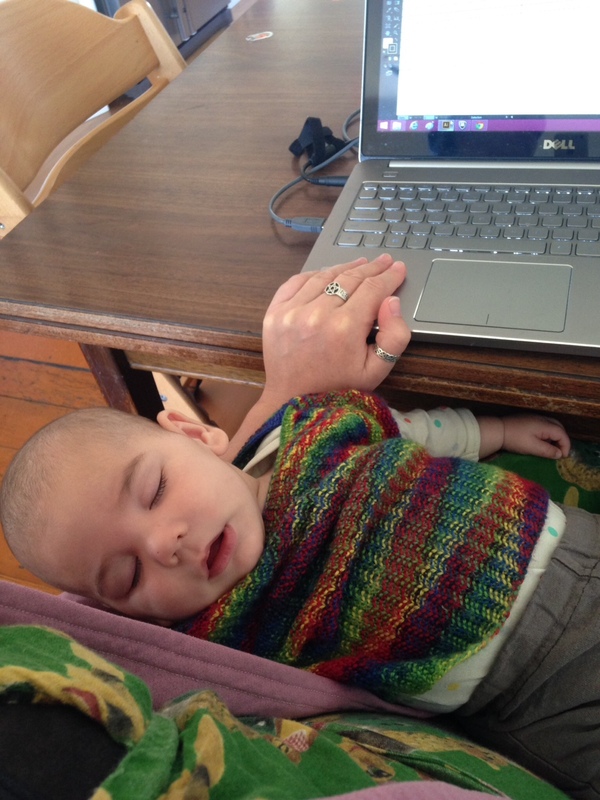 In my case – post-natal depression. 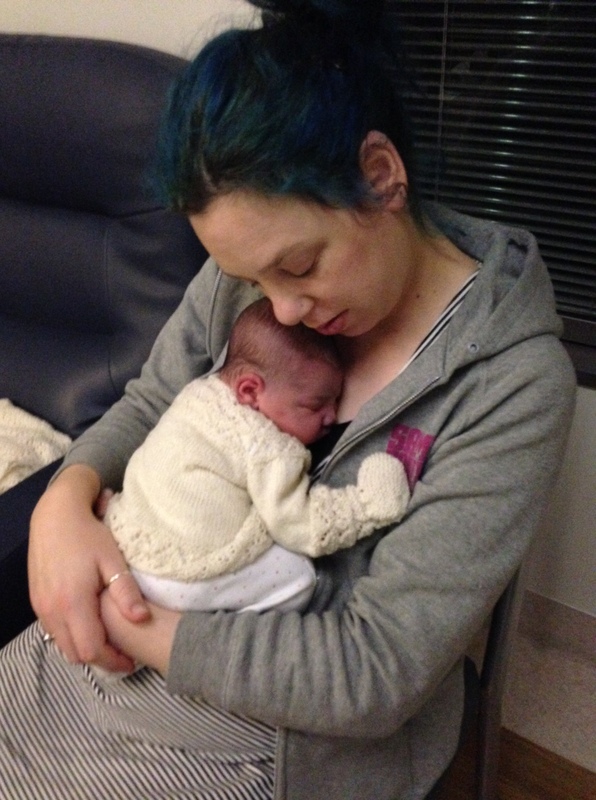 Pretty bad post-natal depression. It came on not too long after my second child arrived. He was terrible at sleeping – only one short daytime nap, and waking up 6-12 times a night. That first year after he was born, I was stumbling through life on about 4-5 broken hours of sleep each night. And let’s face it – that sort of sleep deprivation is used as a form of torture for some pretty good reasons. It does not do good things to one’s brain. It was made worse by feelings of isolation. I was working in a suburb, rather than in the centre of my town, which made it pretty much impossible to catch up with friends during the week. Two young children, no car, and a lack of support in the weekends meant I wasn’t able to see people much during the weekend as well. Add in not wanting to be a burdan to people, so hiding the effects sleep deprivation were having on me, and the sense of isolation built up very fast. My long-term relationship was disintegrating at the same time, which clearly didn’t help (increased isolation, lack of emotional support, etc, etc, etc). 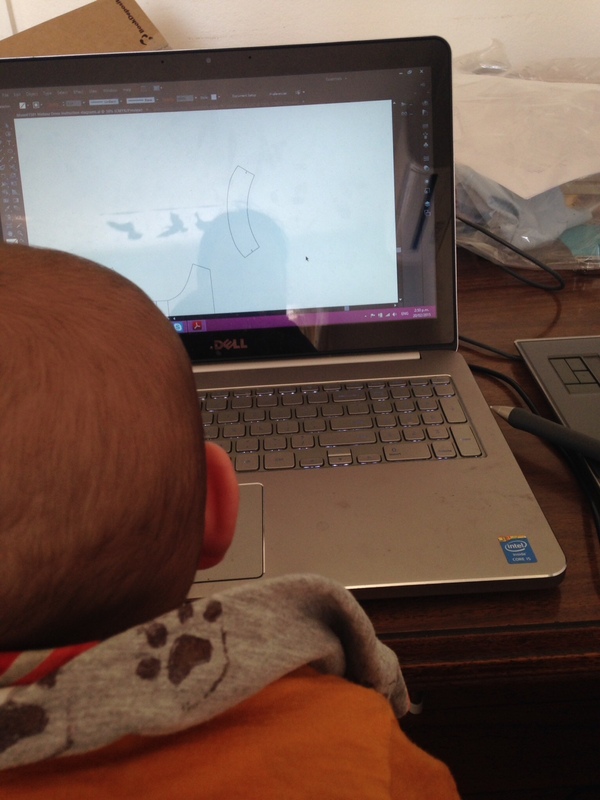 I was having trouble with some family members – feeling that I was being judged for working while having small children; that I was being found lacking as a parent; that I generally couldn’t do anything right. I was having to constantly defend my partner to my family, while at the same time disagreeing with my partner, so it felt that I was constantly caught in the middle, unable to be honest and being under attack from both sides. These factors all built up, and built up. It took some time, I’m not sure how long as time moves strangely when you’re in that head space, but post natal depression sunk it’s claws in deep. And let me tell you – depression hurts! Emotionally, mentally, and physically. I felt that I didn’t know who I was anymore. That I didn’t really exist, and was simply a shell of a person, carrying out roles in life but with no substance. Being a mother, a colleague, an employee, but it was all an act, put on for the benefit of others while inside I was devoid of life. I progressed from feeling isolated, to isolating myself. I felt that how I was feeling would be a burden to others, and so I didn’t speak about it, and I pretended all was well. It was hard to pretend, so very hard, and so I stopped seeing people. I felt that I was bringing down my friends, that they were happier when I wasn’t there, and so I stopped seeing them. The feelings built, the downward spiral continued. I would say things to my now-former-partner such as “I don’t exist anymore”. They were ignored, and I didn’t try to talk to anyone else because I never saw anyone else. I’d sit in my sewing room at night once the kids were asleep, staring at nothing, slumped on the floor, with an empty mind. Even though I was absolutely exhausted through lack of sleep, I put off going to bed at night. Because bed meant darkness and quiet, which meant the thoughts and feelings would come out of hiding. I kept busy when I could, throwing myself into things, then feeling like an utter failure when I couldn’t keep up the unrealistic pace I set myself. But business while it lasted was a distraction from the emptiness and the pain. I kept putting on a mask when I was around people I knew, and let it fall away the moment they were gone. One clear memory I have is walking through the railway station and seeing a colleague – they noticed me before I noticed them, and I didn’t get the mask on in time. I still worry a bit about what they saw in that moment of unguardedness. I was in pain every moment of every day – the emotional pain and emptiness so strong they caused physical pain. I felt so hollow and numb that I understood why people cut themselves – to feel something, to know you are still alive, you still exist. And to try and get some of the pain out of your body, as you feel it’s filling you to the brim and is threatening to overwhelm you and destroy you at any moment. When I had the mask on around others, I’d laugh sometimes. And when I did, on the inside I wanted to curl up in the corner and cry. Laughing on the outside, dying on the inside – it was all an act. I began to genuinely believe that people would be better off without me around. That I was a liability – no good at work, no good as a friend, no good as a partner. I genuinely believed that my then-partner would be better off without me – that he’d be angry with me for leaving him with all the childcare, but that would pass quickly and he’d be happier than if I was there. I even thought that my children, my amazing wonderful children who I would give up anything for, would be better off without me around. I worried about what I would do, as I fought the desire to hurt myself in order to feel something, anything. As I was tempted by thoughts of ending it, so that I wouldn’t be a burdan to others anymore. I got nervous walking near balconys, over bridges, for fear of giving in to the temptation to just jump off. When cooking food, I worried about being near knives, as I would find myself staring intently at them and visualising picking them up. It got so bad, that the only thing that stopped me from acting on any of those impulses was the fear that if I killed myself, my children may get teased about it at school, because children can be extremely cruel to one another. I truly believed they would be better off without me, but I didn’t want to be the source of childhood teasing from their peers. And that was the only reason I didn’t do anything. And then a friend of mine opened up about how she had been battling depression. And I finally went to get help. It was hard to get help. I felt like a failure, like it was shameful, that I was weak and pathetic for not coping by myself. I still feel like that – I’m ashamed to be on medication, even though it’s been nearly a year since I started taking it. It’s interesting, isn’t it? I don’t feel like depression is something people should be ashamed of, but I feel shame myself. I felt too weak to go for help, and yet getting help was also a sign of weakness. yay for conflicted emotions. Anyway, I got help. And things got better. I got put on medication. (Immediately, in fact – my doctor gave me a script nearly as soon as I started talking to her.) I slept a lot, letting my mind heal. I went on a trip with my youngest, and slept and rested and struggled with the feelings of guilt for not seeing people while I was travelling and letting them down and letting myself down, even though I didn’t have the energy to get off the floor of the Airbnb I was staying in sometimes. But the trip helped – I didn’t have to do anything, I just hung out with my then-nearly-two-year-old, slept, wandered, and healed. A friend and I went to an art show, and a painting jumped out at me. Four words, bold on canvas: something changes sometimes always. One of my friends at university had a tattoo on his arm – ‘this too shall pass’. It was a reminder when things got bad, that he would get through it. This painting, those four words, they spoke to me. Things change. They always change. Change is constant, and it is positive. And this is good. I found myself looking at that painting in the morning when I woke up, and at night before I went to bed, as a reminder that this would pass and things could, would, get better. I repeated the words to myself regularly, keeping that reminder, that hope, alive. And I slowly got better. The suicidal thoughts stopped. The self-harm thoughts slowly (far too slowly) left. I was able to laugh again, without feeling like the laughter was tearing me apart on the inside. I went to a music gig, the first one I’d been able to go to in years, and another part of me came back to life and I found myself crying while the music streamed over me and through me and I remembered – I love music. I started walking again – long walks, just for the sake of walking. And I remembered how much I enjoyed that – the feel of wind, the view of stars, the sound of trees. I slowly started playing music at home. And sitting in sunlight, just for the enjoyment of it. I rediscovered how to play with my children, and enjoy their company. I slowly remembered who I was, what I enjoy, the parts that make up me, both good and bad. I’d lost those for a long time, and they took a while to return, but they slowly did, piece by piece, forming out of the grey mist that had clouded everything for so long. And now, I’m back. I’m not the same person I was before – I don’t think it’s possible to be after going through a journey like that. I now understand depression in a way I never could have before, and I can truly emphasise with people going through that, with people who self-harm, with those who see suicide as the only way to end the pain. I wish I didn’t, as that journey hurt so, so much, but at the same time I am glad to be able to understand. I still struggle with feelings of guilt over dropping out of touch with so many people over that time, and over letting people down. Because of that, I’m still quite bad at getting in touch, or keeping in touch – trying to break the habits I formed. I also feel a lot of guilt over how I was as an employee and a colleague during that time – I did my best in the circumstances, but that was only about 20% of my actual best, and for that I feel I’ve let people down. I’ve nearly come to terms with not being the mother I wanted to be for those years, and my grief over that. Some relationships are forever changed, or gone from my life, as a result of that time, and some of those I still mourn for. But I am still alive. And the world is here, and it is an amazing place, and I am enjoying it again. There are many people I love and care for, and I enjoy their company. I’m excited about the future, and about showing my children the world in all of it’s beauty. I listen to music, I read books, I play with my kids, I walk in the starlight, and I sew pretty dresses. I’m glad I’m here. And I’m so very, very grateful to that one friend who reached out a hand when I most needed it and shared her story. That’s why I am sharing mine. Because if you’re feeling like that – you don’t have to. Things change. Things will get better. And you don’t have to do it all yourself. People do genuinely care for you, and they want you around, even if you don’t believe it, even if you don’t like yourself. Life is a journey. Things are constantly changing around us. And that’s a good thing. Yikes, it’s been a while since I posted! Most unlike me. So I thought I’d drop on by, give a little update about what’s been going on. No finished projects to show in this post I’m afraid. Although I have been sewing and making like crazy! 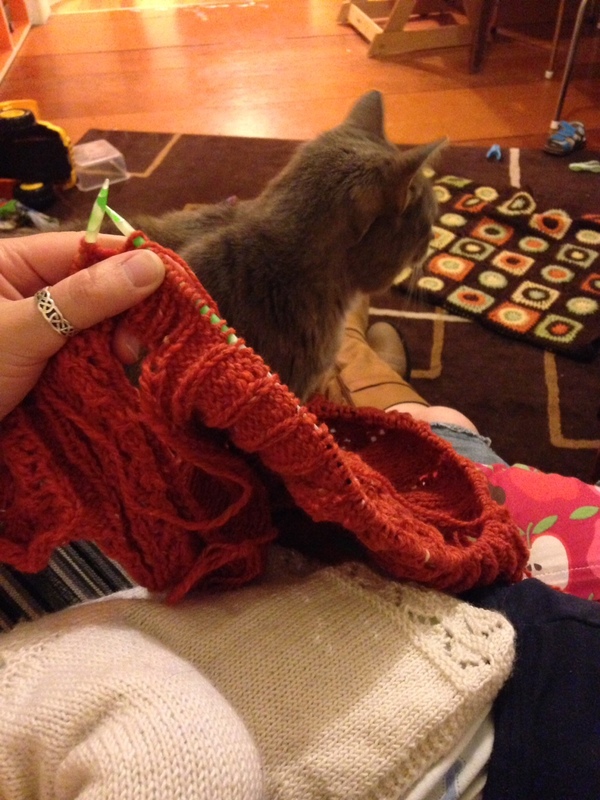 I’m hoping to have a finished garment to post about very soon though…. 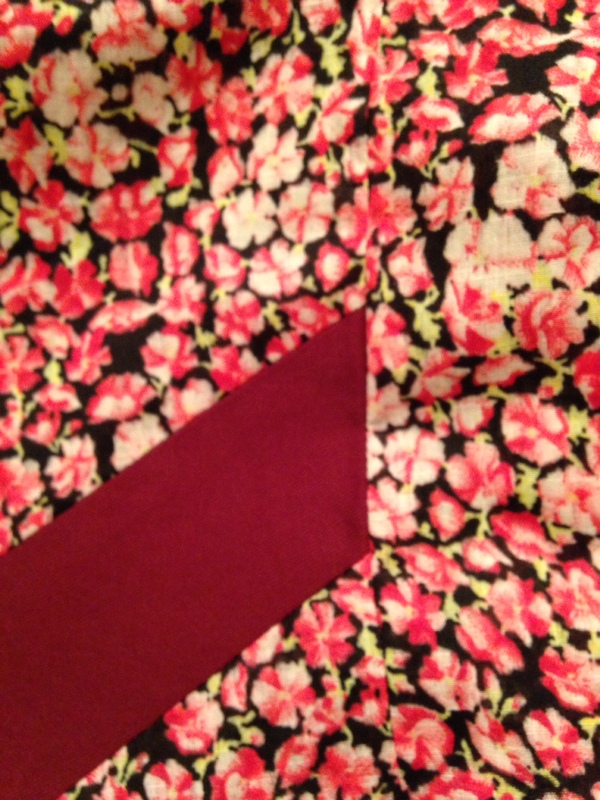 Exciting thing about that rayon fabric – it’s my first make as part of the Minerva Crafts Blogging Network! So exciting!! 😀 I’ve been watching the Minerva Crafts and Mood networks with interest, and wondering if anything like that would start up down in this part of the world. 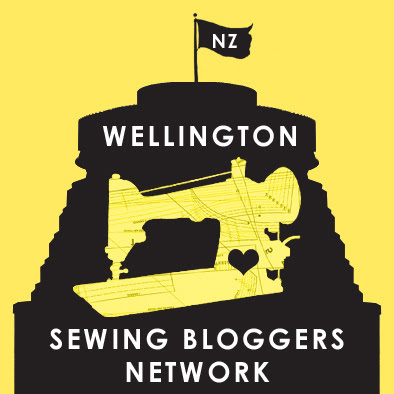 Turns out Minerva are happy to work with a New Zealand based blogger, and I’m now a part of their blogging network! So you can expect to see a creation a month for the next three months (at least) on here as part of that. They’ll be my usual mix of vintage and indie patterns, and typical colourful prints, coz that’s how I roll. (Bonus: I can now get my hands on things that are hard to get here in NZ. Like this feathers print rayon. Yippie!) 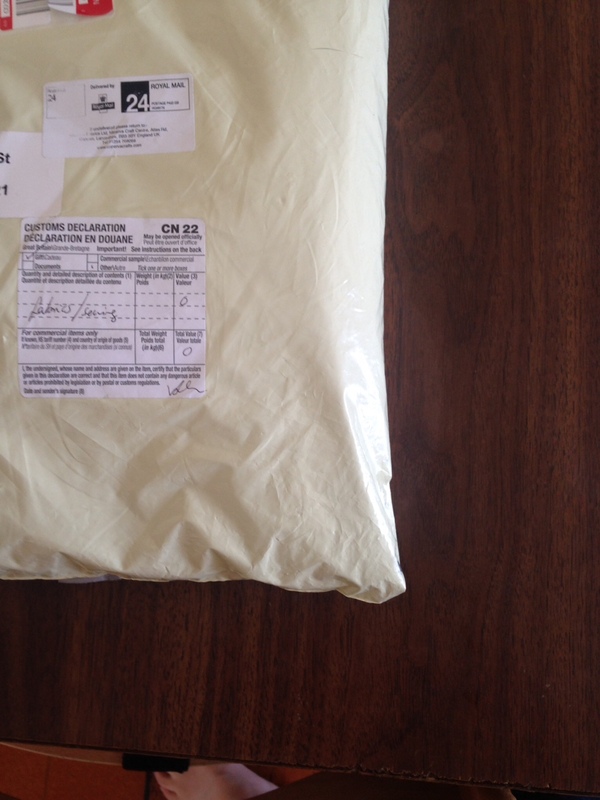 ‘Twas an exciting day when my first Minerva network package arrived…. 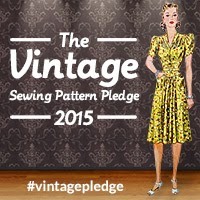 You may remember in my round-up post for 2014 I mentioned that I’m really looking forward to working with vintage patterns more this year. 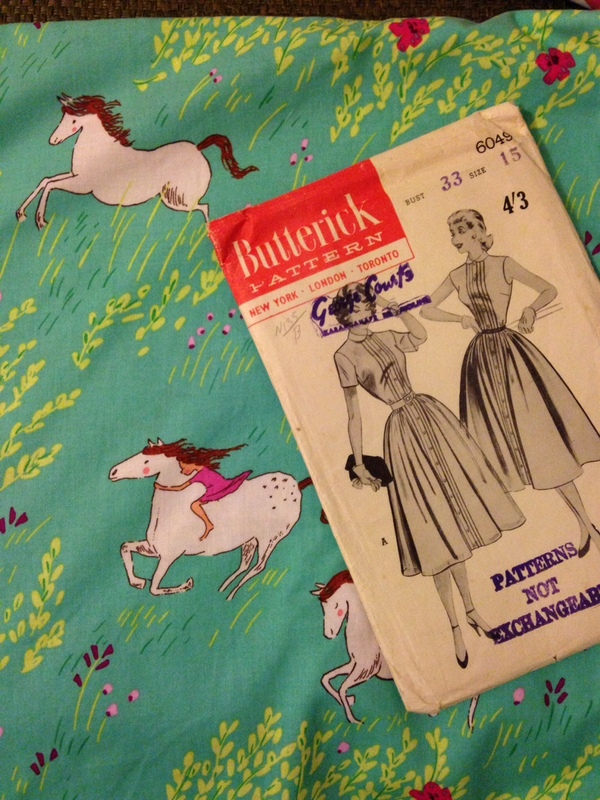 I have general plans to more-or-less alternate sewing vintage with sewing indie. Until that gorgeous rayon landed on my doorstep and jumped the queue (what can I say? It was so pretty it demanded I make it immediately!) I was planning to make this combo. The fabric is from the Michael Miller Wee Wanderer line, pattern is 1950’s. Then I decided I didn’t like the pairing due to the large-scale print and the pintucks, so I’m currently hunting for another vintage shirt dress pattern I want to pair with it. Need to find it soon, as it’s next on my list to make! 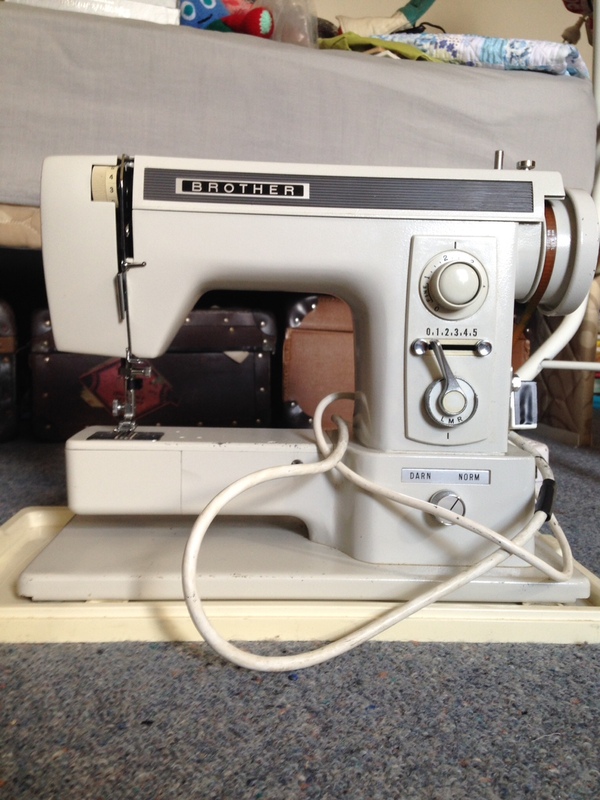 I has plans to use all my vintage machines this year, sewing a dress on each machine from a sewing pattern that’s roughly from the same year as the machine. Really looking forward to that! 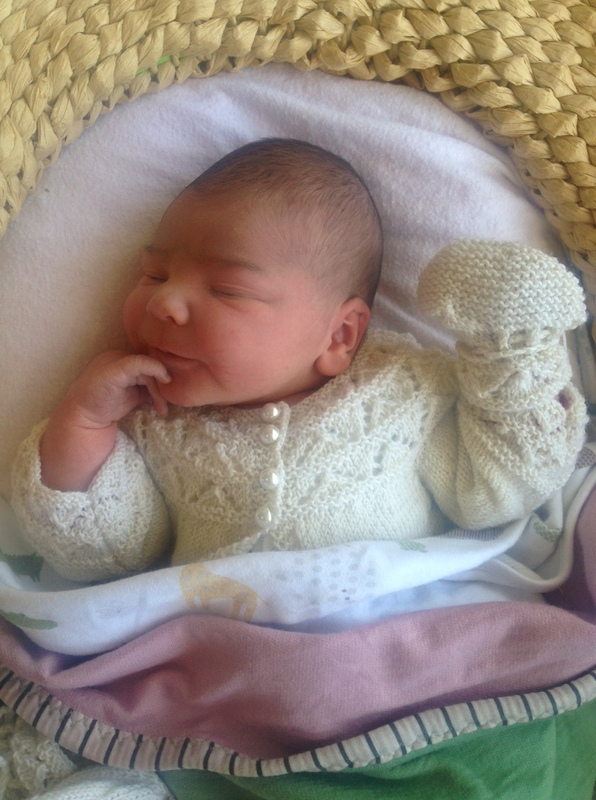 Been doing a bit of knitting as well, usually while juggling a baby and a cat. Unsurprisingly, progress is slow. But this will be the Agatha cardigan by Andi Satterlund. But also evidence that progress is being made! Taping up of PDF to test the printing…. 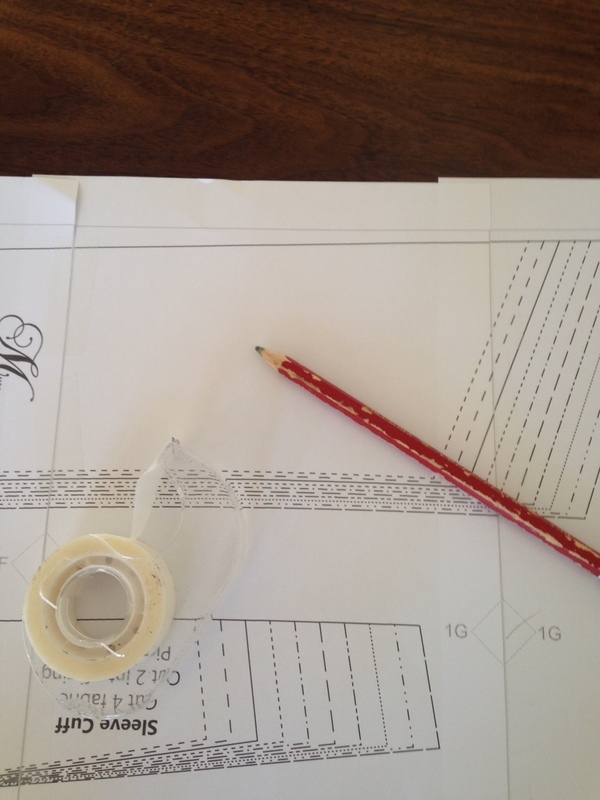 … and stitching up of sample garments. I’m hoping to have this one released in the next couple of weeks. Eek! So yes, that’s what I’ve been up to! Oh, and starting back at work part-time. Easing back into it, and I’ll be back full time at the end of April. It’s going by crazy fast, eek! What have you all been up to? Are you having a good 2015 so far? Just a super quick post with the news for those who are interested. 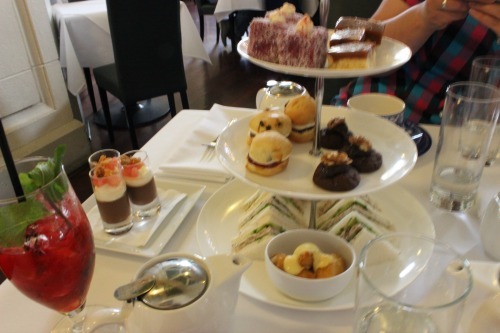 It may have been a while, but my plan to experience and review all the High Tea places around Wellington continues! Today, I caught up with the lovely Mel and Nikki to get some photos for our blogs (so, so much more fun getting photos with other sewing bloggers!). And since it’s hungry work running around, posing, and shimmying into new garments half-hidden by trees in public parks (um, yeah. Anyone else do that? 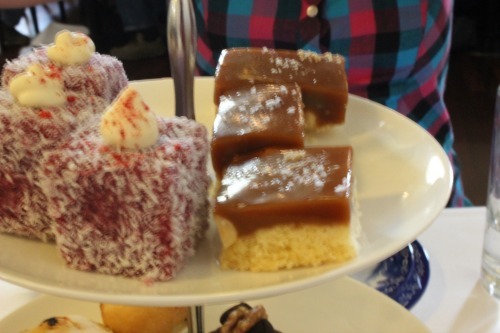 *cough*), we rounded off the afternoon by going for High Tea at Logan Brown. 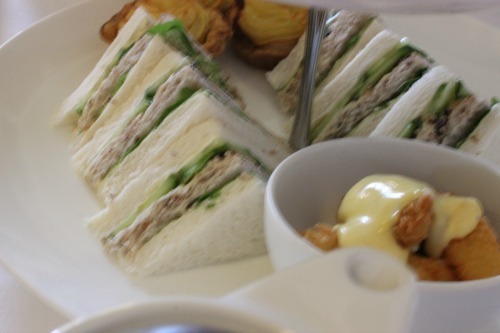 We were given the option of three different High Teas – the classic one (treats and a pot of tea), the deluxe (plus either a glass of bubbly or a cocktail (or mocktail) from their tasty looking menu), or the extravagant one (complete with a glass of proper champagne). 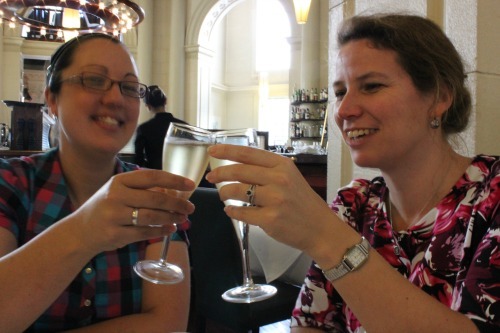 We all went for the deluxe one – Mel and Nikki choosing a glass of bubbly, and me going for one of the two mocktails – I went for the one with raspberry and mint and Limonata (or whatever it’s called). Which, by the way, was extremely tasty. 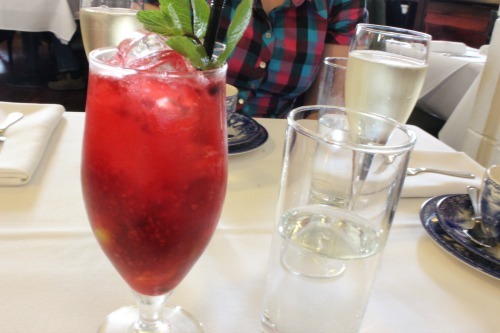 It had real raspberries crushed up in it, wedges of lime at both top and bottom, and a great tart-sweet taste. 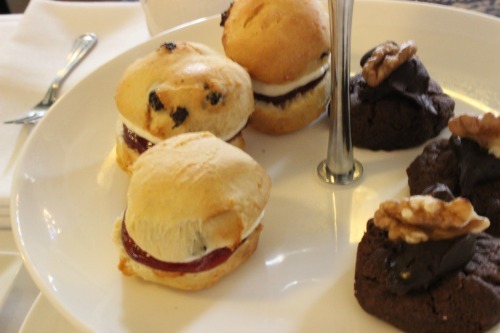 A three-tier plate of tasty treats soon arrived, along with a side dish of three little shot glasses, and our individual pots of tea. And very tasty treats they were, too! A good mix of sweet and savoury, a good quantity, and an interesting combination of unusual and classic. First, the savouries: sandwiches with cucumber, rocket, truffles and something else. Very tasty. Mini venison pies with a potato top. And a surprising and amazingly tasty little dish of some sort of fluffy cheese, battered and deep fried so it was all melted inside, topped with some sort of slightly spicy mayonnaise. Plate two: orange and date scones with whipped cream and raspberry jam, and mini afghans with chocolate ganache icing. Plate three: salted caramel peanut slice. And oh! That caramel! It was proper caramel, the soft and chewy sort that sticks your teeth together and takes ages to eat, while you enjoy every moment. And the raspberry lammingtons – seeped in good, real raspberry jam. 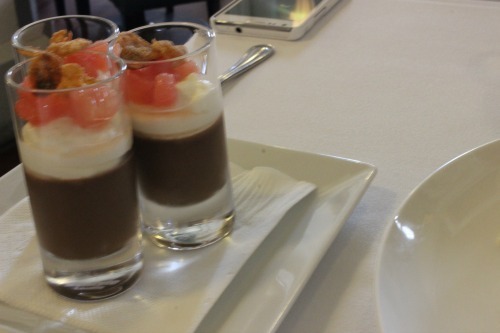 And to finish off: chocolate shots, with whipped cream, ruby red grapefruit cubes, and caramel cornflakes. 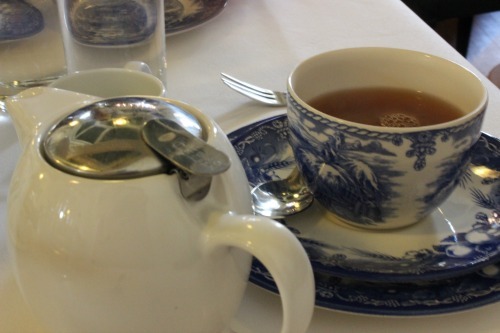 As an added bonus, they topped our tea up for us so we could sit there and enjoy another cup or two before we headed off home again. All up, I’d recommend Logan Brown for High Tea. It’s decent value for money ($35 per person for the classic high tea, $45 per person for the deluxe one), the service is fantastic and at just the right level of attentive (they discretely leave you alone yet manage to appear just before you realise you want something), the food is fantastic and there’s a good quantity of it – enough to leave you feeling satisfied without being overly full. 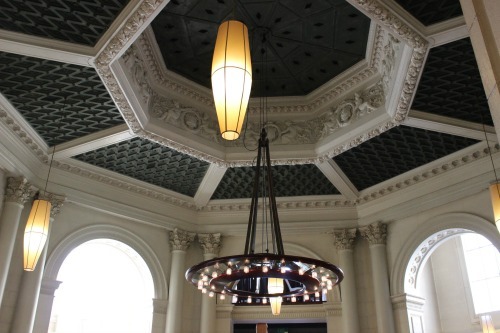 Plus, it’s a rather interesting venue. Very high ceiling, in fact the room is probably nearly as high as it is square. They’ve done interesting things with the space to make every table feel private and comfortable, and there is rather random art work dotted all around. So, some of you may have noticed that I’ve been compiling a list of all the sewing challenges and meet-ups that I see, to keep ’em all in one handy place for anyone who’s looking for a challenge. Waaaaay back in April (?!?! Where’s all that time gone?!?) the lovely Tempest suggested I make a button for the Sewing Challenges page, to help people remember where it is. Luckily the wonderful Melissa, clever designer that she is, came to my rescue, and has designed a super button! Yay!!! The first Sew Weekly Reunion is happening! Yay!! The theme is the Pantone fall palette, entries are due in by the end of August, and will be featured on the Sew Weekly Reunion blog during September. 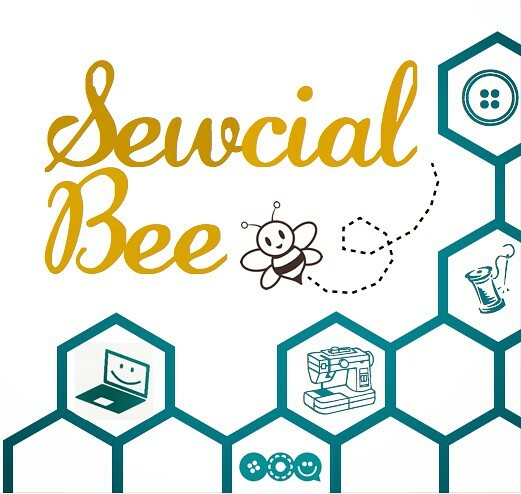 I’m pretty excited to see that there’s another Sewcial Bee happening this month, since I found out about the first one far too late! The theme is being announced this weekend – you then have 48 hours to make something to the theme and post it to the Flickr group. So there we have it, folks. Three challenges to get you all inspired this weekend (and there are a bunch more over on the Sewing Challenges List page), and a button to help you find out about others in the future. Vicki Kate, where are you?!? Vicki Kate, are you out there? If you are, you’ve won one of my Mystery Make packs and I need you to send me your address so I can post it to you! Hi! 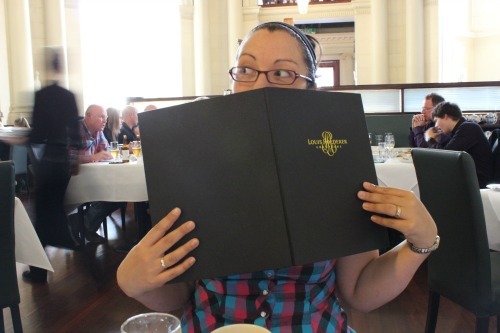 I'm Kat, a 30-something girl living in Wellington, New Zealand. 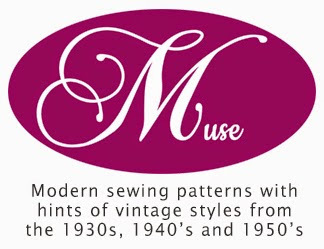 I love sewing, 1940s and 1950s styles, bright colours, quirky prints, cats, cupcakes, flowers, op shopping (thrifting), reading, and various other things too. Want to know more? Enter your email address to subscribe to this blog and receive notifications of new posts by email.